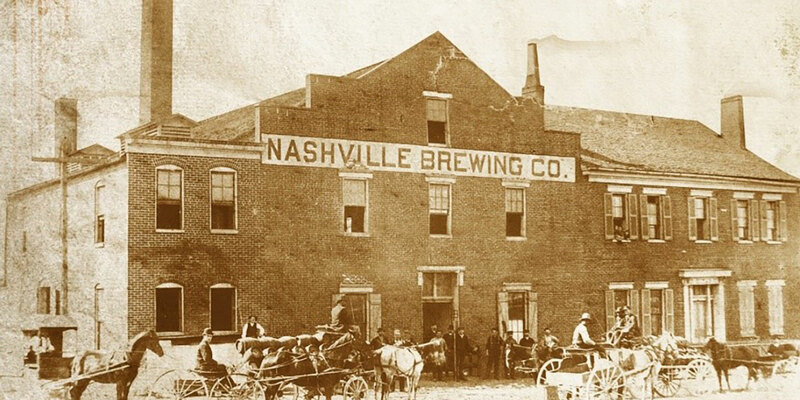 A photo of Nashville Brewing Company from the 1880s. Most of us know that unsettled conditions in Europe in the early 19th century caused many Europeans to immigrate to the United States. We also know that many of these immigrants brought their trade skills to help shape the framework of our country. One of these trades was the art of brewing. Many German immigrants settled in cities such as Milwaukee, Cincinnati, and St. Louis, which later became famous for their brewing history. What most people do not know, including many Nashvillians, is that Music City had its share of German immigrants as well. By the 1840s, Nashville was booming and conditions were prime to support industry. This was very attractive to the Germans who did not want to settle in the frontier. These Germans formed a tightknit community in North Nashville, which later became known as Germantown. These new settlers also brought their trade skills to this blossoming city, such as butchery, tanning, merchandizing, cabinet making, boot making, and of course, brewing. However, prior to the influx of German brewers, records show that there were several small ale breweries operating in the outskirts of Nashville. As early as 1815, Thomas M. Burland was operating the Nashville Porter and Ale Brewery, using water from a spring on the Cockrell Farm, just west of Nashville. Twenty years later, another brewery, known as the Cockrill Springs Brewery, operated here from 1838-1842. A section of land from this farm was later given to the City and is now known as Centennial Park where the Cockrill Spring is preserved. In a twist of fate, 200 years later, Blackstone Brewing Company, unknowingly, built its brewery on land that was once part of the Cockrill Farm! About 5 miles east of Nashville, the A. Redmond & Co. started the Porter Brewery in 1818. Redmond also operated a bakery at this location, which occupied an area along Mill Creek (near the Nashville Airport). After Redmond’s death in 1825, his wife sold the brewery to Paul Bianchi. It operated as the Millcreek Brewery for several more years. By the 1850s, Germantown was flourishing and lager breweries starting opening up in the area. A brewery/bakery was opened by Fred Hauser on the corner of Jefferson St. and Cherry St. (now 4th Ave N.) in Germantown. This brewery was later sold to Joseph Streurer in 1857. Around this same time, George Bittell opened a brewery near Buena Vista Springs in North Nashville. 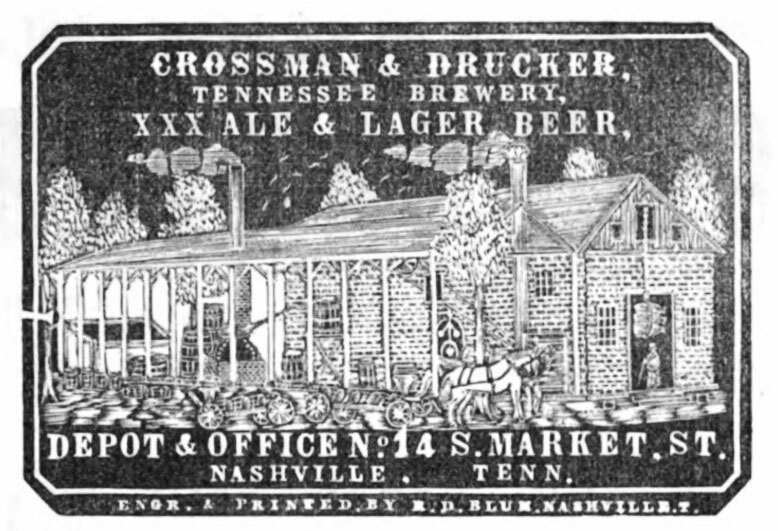 On the east side of Nashville, Crossman and Drucker had also opened the Tennessee Brewery, which may have been at the same location of the Millcreek Brewery from several decades earlier. Unfortunately, this brewery was destroyed by fire in August 1860. 1859 was a significant year for Nashville; construction of the Tennessee State Capital Building has completed as well as the opening of the Church of the Assumption in Germantown. Also, just south of town, Jacob Stiefel (also commonly listed as “Stifel” in American publications) opened the Nashville Brewery in 1859 on the corner of High (now 6th Ave S.) and Mulberry Streets. Because of the popularity of lager beer, Stiefel and his partner Louis Peiffer, designed the facility to be a modern brewery with cellars for lagering. 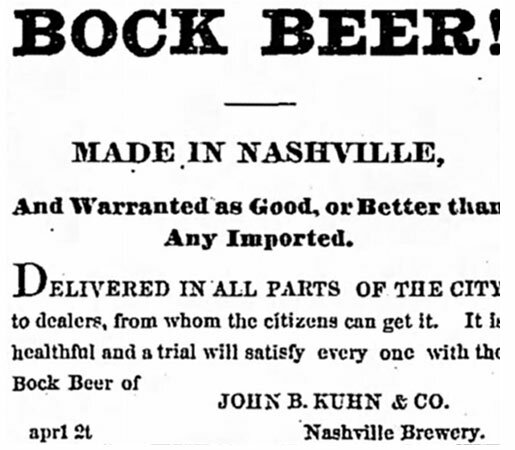 A clip about bock beer printed in The Tennessean in April 1876. With the onset of the Civil War, brewery production ceased in Nashville, as did most industries. Beer was not brewed in Nashville for the next four years. Although the Civil War battles were at their height in Nashville in 1864, troops and civilians alike demanded fresh local beer. Stiefel decided to reopen the Nashville Brewery in May 1864 to meet this demand. To avoid confusion between Stiefel’s Nashville Brewery and Krieg’s Nashville Brewery, they were often referred to as the South Nashville and North Nashville breweries, respectively. 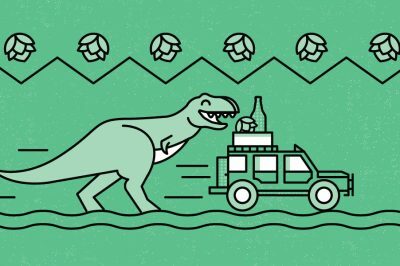 The success of these Nashville breweries did not last long. Larger breweries in Cincinnati and St. Louis began shipping beer to Nashville via rail or boat. Throughout the ownership changes, the Nashville Brewing Company continued to brew traditional lager beer. Each spring, the brewery would keep to the Bavarian custom of brewing bock beer. Many brewery historians trace bock beer back to the days when Bavarian’s would brew this stronger style of beer to supplement nutrients while fasting during Lent. Another version of bock called maibock (May Bock) continued to be enjoyed well after the fasting season. The next chapter of Nashville’s brewing heritage starts with two German immigrants from Cincinnati expanding their business to the South. Christian Moerlein, a prominent Cincinnati brewing tycoon and his apprentice, William Gerst acquired the Nashville Brewing Company in 1890. 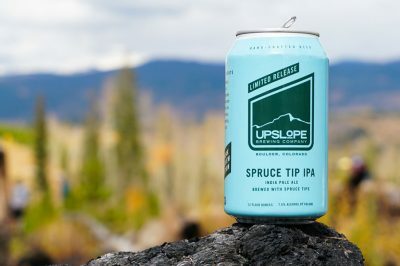 Their first order of business was to demolish the aging brewery and rebuild it from the ground up with such modern amenities as refrigeration and a bottling line. The newly constructed facility would operate as the Moerlein-Gerst Brewing Company for the next few years until Gerst bought out Moerlein’s interest in 1893. The renamed William Gerst Brewing Company continued brewing lagers through the turn of the century. With the success of the brewery, Gerst became a prominent citizen of Nashville. He invested profits into various hobbies, including horse racing. Gerst had stables at his farm in South Nashville and his horse Donau (name after the Danube River) ultimately won the Kentucky Derby in 1910. Gerst’s success soon came to a halt with the temperance movement, resulting in Tennessee becoming a dry state a decade before national Prohibition. Gerst continued to operate the facility with a skeleton crew, brewing non-alcoholic malt beverages and producing contract sodas such as Delaware Punch and Orange Crush. Although the William Gerst Brewing Company would survive Prohibition, William Gerst did not. Gerst died shortly before the repeal of the 18th Amendment. His four sons continued operating the Gerst brewery for the next two decades. However, the brewery would never match the success it had prior to Prohibition. By 1950, larger breweries were taking advantage of television advertising and refrigerated rail cars, giving them the ability to ship nationally. The Wm. Gerst Brewing Co. met the same fate as many regional breweries and permanently closed its doors in 1954. Beer would not be brewed in Nashville until the birth of the craft brewery movement. Today the Nashville area has more than 20 craft breweries. In 2016, I revived the Nashville Brewing Company by partnering with Blackstone Brewing Company, Nashville’s oldest craft brewery. The Nashville Brewing Company is brewing traditional lagers as the German immigrants would have brewed in the late 1800s. 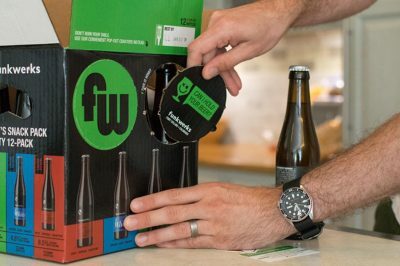 As the annual Craft Brewers Conference comes to Nashville April 30 through May 3, the Tennessee Craft Brewers Guild is bringing Nashville’s German brewing roots to the forefront. Tennesee breweries came together to create Mockingbird Maibock — a beer the guild says “is one of the finest maibocks in North America.” The maibock will serve as the conference’s official beer, and also give Tennessee craft brewers an opportunity to proudly put their strong brewing heritage on display. 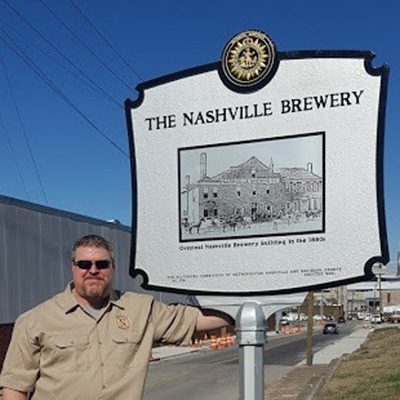 Scott Mertie and his wife, Candy, petitioned the Nashville Historical Commission to erect a historical marker where the Nashville Brewery and Gerst Brewery once operated. Scott Mertie is the author of “Nashville Brewing” (Arcadia Publishing, 2006) and the owner of the Nashville Brewing Company (2016 – present).